Biography: Lawrence Makoare has established an impressive acting career over the past seven years, after his talent was discovered by Don Selwyn in a drama class. Makoare says he was a road maintenance worker who stumbled into acting by mistake. He went to the drama class with his former wife, to look after their son while she participated, but Selwyn encouraged him to join in and very quickly arranged his first audition. 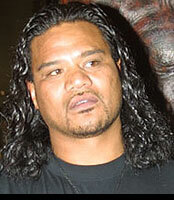 His first role was in the Hollywood feature film Rapa Nui, which was filmed in Easter Island and other features include The Price of Milk, What Becomes of the Broken Hearted?, Feathers of Peace, also produced by He Taonga Films, and a lead role in Crooked Earth, playing Temuera Morrison�s brother. He also played three different characters in The Lord of the Rings. His television work includes Xena: Warrior Princess, Young Hercules, Greenstone, Mirror Mirror, and the He Taonga Films dramas ITFM and Oma Rapiti, plus short films and commercials. Of Ngati Whatua descent, Makoare grew up in Bastion Point, Auckland, where he still lives. He is not a fluent Maori speaker, learning the lines necessary for his character through intensive study and mentoring by Waihoroi Shortland, who plays Shylock. In addition to road work for the City Council and other physical labouring jobs, he has also worked as a Maori wood carver. He is a keen sportsman, playing rugby league, touch football and softball as well as scuba diving, fishing and swimming.